It was barely a month ahead of the delivery of her child, a highly exciting moment for a mother, when Li Qing, a young woman in Jiangyou, Sichuan Province, realized that she was diagnosed HIV positive, a shocking announcement which erased all her happiness three years ago. "I was really desperate at the moment," Li recalled. "I just wanted to die so I cut my wrists." Fortunately, the gynecologic and obstetric interventions from the local maternal and child care service center and the center for disease control and prevention successfully prevented the disease transmitting from mother to child and Li's baby was born healthy. "If it was not for their help, I would not have had the courage to continue to live on," the young mother said. Many stories like Li's are particularly prevalent in China's far-flung countryside where women do not have enough awareness of how HIV is transmitted from many sources, especially from their partners. The dignity and equality for women who have succumbed to the disease has become a big concern for the UN and a number of social organizations, such as the Women's Network Against AIDS-China, which is engaged in joint efforts in hope that the AIDS epidemic can be terminated by 2030, a proposal agreed by global leaders at the UN General Assembly in September of 2015. On Friday, two books entitled "My Children and I — Stories of A Mother Living with HIV" and "Power of Women" developed by the Women's Network Against AIDS-China and supported by the joint hands of UNAIDS, UN Women and the British Embassy in Beijing made their debut at Ditan Hospital, where the first case of HIV across the country was diagnosed in 1987. The books were published amid concerted efforts of both domestic and international communities to help women suffering from AIDS live with zero discrimination. Julia Broussard, the Country Program Manager of the UN Women in Beijing, said in a panel session at the launching ceremony that "economic power, decision-making power and certain resources like education and accesses to finance are not held equally across society between men and women. Every society in the world faces this unequal structure." "Women living with HIV are subject to a greater number of stigmas, discrimination and are more vulnerable to infection by their partners often because they face being controlled or are subject to violence," she continued. Broussard said voices and the needs of women living with HIV should be taken into account as UN Women and other social organizations should make joint efforts to help them. Among the rights of women living with HIV, the primary demand is their desire to be mothers. China has launched full coverage to finance the prevention and control of AIDS, syphilis and hepatitis B since 2015, which suggests women in pregnancy or maternity can receive free testing for these infectious diseases. For those that turn out to be HIV positive, they can receive free comprehensive clinical interventions, such as PMTCT. Now, after a 15-year endeavor, over 98 percent of pregnant women have received HIV tests and about 92 percent of affected mothers have received anti-virus treatments and interventions when giving birth to their children. "When the first pregnant woman arrived at our hospital in late 2000, we were not as confident as we are now and questioned whether AIDS affected patients can deliver babies," said Liu Min, a doctor at Ditan Hospital. 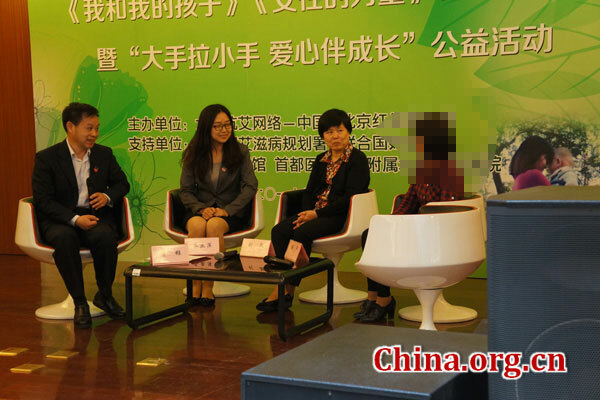 "We looked up many medical materials when providing PMTCT to the woman, a Xinjiang native, and succeeded in ensuring a healthy baby by cesarean delivery," Liu recalled in the panel discussion. "During the past 16 years, we have provided treatments and interventions successfully to more than 100 patients," the doctor added. Among those clinical cases, there is only one treatment that has failed to prevent the disease from transmitting from a mother to her child in the hospital, simply because the mother did not receive PMTCT until her delivery. "As long as we apply PMTCT in time, a rate of zero transmission of AIDS can eventually be achieved," the doctor said. Apart from PMTCT, community services to follow the living conditions of AIDS affected mothers and their children have also been highlighted as a principal measure to obtain first-hand knowledge of these people's needs and difficulties. "Families and communities are encouraged to extend care and love to people living with HIV," said Qiao Yaping, a staff member at the Chinese Center for Disease Control and Prevention. Three years have passed, and Li's change of spirit is obvious as she has overcome social stigmas and personal desperation by pulling herself together and concentrating on raising her child and joining in volunteer organizations to aid people who are similarly suffering. "What I'm looking forward to now is to live happily and exchange my love and care with women prone to the same disease," said Li. Two new books showed how UN Women and other social groups in China to empower AIDS-affected women to live with equality and dignity.